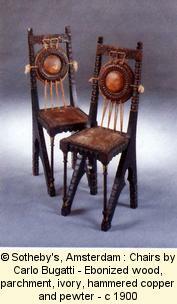 Main artist : Victorio Chini (ceramics), Sommaruga (architect), Carlo Bugatti (furniture : here two chairs in ebony, parchment, copper and ivory circa 1900). Visit Milano Art Nouveau. In 1902, Torino organized the 1st international applied arts exhibition which was definitly the most impressive Art Nouveau exhibition ever. Visit Torino Art Nouveau. More specific links about Torino, Milano, Roma can be found in the dedicated sections.